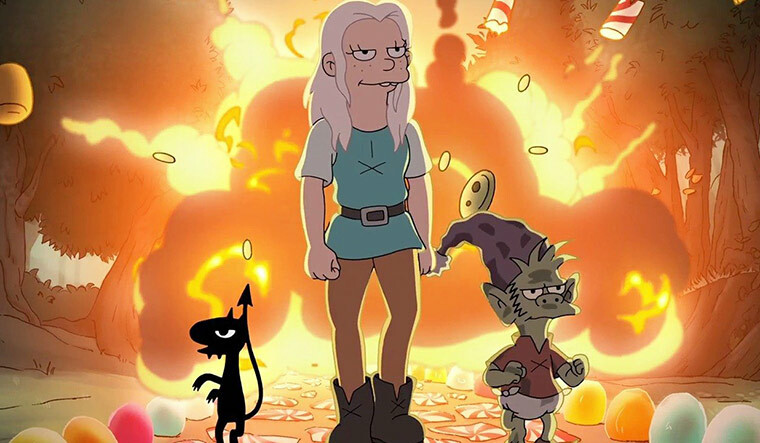 Matt Groening’s latest Netflix series, Disenchantment, fails to enchant and pales in comparison to other Netflix fantasy series. Groening’s fans, who expected another Futurama or The Simpsons, will be disappointed as the humour is dry and uninspired. The series tells the story of Bean, the princess of Dreamland, a fantastical medieval kingdom. The hard-drinking misfit princess is cursed with her own demon, Luci, who is constantly egging her on in wicked ways. Elfo, an escapee from his candy-making, overly-cheerful homeland, joins them in their escapade. He harbours an immense crush on Bean. Though Bean is no Fiona of Shrek, the violent, alcoholic princess is a break from the stereotypical slender sleeping beauties. Each episode is almost half an hour long; except for the pilot which is 35 minutes too long. Netflix’s advantage of no time constraints is actually a disadvantage as Groening and his writers are used to the tight structures of half hour sitcoms that are interrupted by commercial breaks. Groening’s revelation of the fully formed Dreamland universe in one go leaves no time for character formation, making it difficult to relate to. But there are signs of refinement as the season progresses. There is heart in the writing, great animation, superb voice acting and a cliffhanger ending. Let us hope Disenchantment goes the same way The Simpsons did.